The only game to sell better than State of Decay on XBLA is Minecraft. There are sales stats, there are great sales stats, and then there is State of Decay, the zombie apocalypse title that, according to developers Undead Labs, has moved 250,000 units in 2 days on Xbox Live. The only title to ever surpass that sales record is Notch's fabled Minecraft, which already had an excellent sales history before moving to the console. "There just aren't the words to describe the feeling," says Undead Labs, which went into this without any marketing budget whatsoever. State of Decay did it on word of mouth alone. 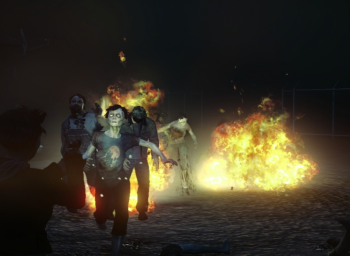 "All we had," says Undead Labs, "was what we believed was a great game and a great community. And make no mistake, a solid game is not enough, not in 2013." The fans pushed State of Decay the rest of the way. Undead Labs promises to "never going to stop pushing to make the best games we can," and dreams of busting the all-time Xbox Live sales record of 6 million copies. State of Decay is an open world apocalypse title, in which you have to plan as well as shoot your way to survival. You need a strong base camp, a working community, supplies of food, water, ammunition, and a whole lot of luck. It escaped the zombie pens back on the 5th, but - though a PC version is in the works - it's just an Xbox 360 title at the moment.